London: G. Bell and Sons, 1930. Full-Leather. Collectible; Fine. 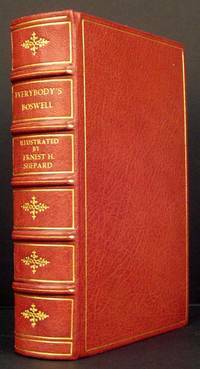 #61 OF 350 COPIES SIGNED BY ERNEST SHEPARD on the limitation page. A beautiful copy to boot of the 1930 1st thus. Bound by Asprey & Co. of London in a sumptuous full red leather. Decorative raised bands, gilt-tooled compartments and gilt-rule to the panels. Bright and Fine, all edges gilt. Thick octavo, 609 pgs., marbled endpapers. Signed by Illustrator. London: Chatto & Windus, 1908. Three-Quarter Leather. Collectible; Very Good. A handsome copy of this 1908 reprint. Sumptuously bound (and signed) by Bayntun of Bath in 3/4 navy-blue leather over light-blue boards. Decorative gilt-tooling, raised band at spine. Solid and Near Fine. 12mo, 278 pgs., top-edge gilt. New York: The Colonial Press, 1902. Three-Quarter Leather. Collectible; Very Good. "Comprising More's Utopia, Bacon's New Atlantis, Campanella's City of the Sun and Harrington's Oceana". A handsome copy of this 1902 limited edition--1 of only 100 copies issued. Bound in 3/4 dark green morocco over light green boards. Raised bands, gilt-decorated compartments, bright gilt-lettering along spine and bright gilt-rule to panels. A Clean, tight, VG+ copy. Octavo, 416 pgs., top-edge gilt.